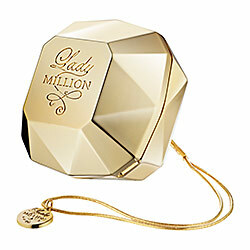 Scent Description and Notes: “Vibrant and sensual, Lady Million is like a voluptuous nectar of flowers. Powerfully seductive, the sparkle of bitter orange and a hint of raspberry reveals the fragrance’s first breath. Smooth and bright, a burst of neroli follows. Then the lethal weapon: heady orange blossom slips out of its sheath. Its narcotic sweetness then reveals itself, bewitching and demanding all attention. Joining with sambac jasmine and underlined by gardenia, the blend soars into something more carnal—yet ever subtle. Now the obsessive pulsing of patchouli enters the fray, pacifying notes of honey with an addictive and supremely tempting sweetness. Amber endnotes become all enveloping, floating around like a ray of light on a diamond. The legendary house of Paco Rabanne, renowned for its use of glistening metallic color and expressive design, tapped world-famous industrial designer Noé Duchaufour-Lawrance to create the bottle. The known Regent diamond, which is on display at the Louvre and is considered the most beautiful in the world, inspired the bottle’s design. Neroli, Bitter Orange, Raspberry, Orange Flower Absolute, Sambac Jasmine Absolute, Gardenia, Patchouli, Honey, Amber. Bottle Design and Artwork: I tested from the bottle itself, which is a small, golden geometric orb that rests on its side rather than on the bottom like traditional perfume bottles. ITB: I didn’t even sniff this one before I sprayed myself with it. I adore the male version and since I was in the airport, I didn’t really have the means to do the normal testing that I would at home. Dry: At the end of the day, it’s a softly sensual scent that leaves behind notes primarily of honey, amber, gardenia, and orange flower. Other Impressions: This would be a yes for me and will be going on my wishlist promptly.